The Denver Broncos are expected to sign punter Marquette King to a three-year contract, according to Mike Klis of 9 News. King punted 69 times last year, averaging 47.4 yards per punt in 2017. King’s punt average ranked sixth overall in the NFL. In week four of the 2016 season, according to Pro Football Focus, Marquette King had the single-best game for a punter ever graded by the outlet. The former Raider ranked among the top-10 punters in terms of overall grades in each of the past three seasons and in 2017, he ranked third overall — the highest ranking in his career. Known for his dancing and celebrations after his punts, King will join Riley Dixon in a now crowded room of punters. Dixon is under contract with the Broncos until the end of the 2019 season, however his future now appears much more foggy after the King signing. Dixon ranked 24th in the NFL with a net average of 40.2 on 73 punts in 2017. Dixon had two punts blocked last year, tying for a league-lead, while King going into his seventh year in the league, has only had three punts blocked in his career. King (6-0, 195 pounds) is a sixth-year player who appeared in 80 regular-season games and one playoff contest during his first five seasons with Oakland. He was signed by the Raiders as a college free agent in 2012 from Fort Valley State University. The only player in NFL history to record at least a 40-yard net punting average in each of his first five seasons, King has punted 426 times for 19,941 yards (46.8 avg. / 40.8 net) with 156 kicks inside the 20 and just 33 touchbacks. King appeared in every game for Oakland for the fifth consecutive season in 2017 and finished with a career-high 42.7-yard net average to rank third in the NFL. 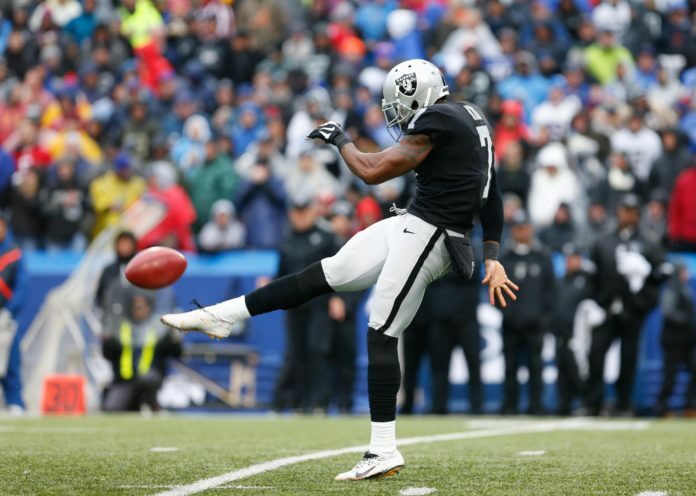 In 2016, King was named a second-team All-Pro selection by the Associated Press after posting the second-highest punting average (48.6) in the NFL and tying for the fifth-most punts (34) placed inside the 20. He ranked second in the league with a franchise-record 40 punts placed inside the 20 in 2015 after setting team single-season marks for total punts (109) and punting yards (4,930) during his 2014 campaign. After spending his rookie season in 2012 on injured reserve, he won the Raiders’ starting punting job in 2013 and went on to lead the NFL with a career-best 48.9-yard punting average—the fourth-highest single-season mark in team history. A four-year punter at Fort Valley State, King was named Team MVP and received first-team Southern Intercollegiate Athletic Conference recognition following his senior season (60 punts, 2,582 yds., 43.0 avg.). He was selected to play in the HBCU All-Star Bowl Game. King, who began punting as a junior at Rutland High School in Macon, Ga., was born on Oct. 26, 1988.